On a rain-soaked away-day, two goals from Rory Page, an early contender for goal-of-the-season from Matty Harris, and a goal and man-of-the-match performance from Jeff Badu was enough for the Parrots to shade a seven-goal-thriller. The mercurial Player-Manager Jamie Duff had much to say post-match. “I hate to bang on about food all the time but we didn't get burgers last week at home and this week away we got nothing, nowt, not a morsel. This just compounded a tough week, actually. Theresa May's impersonation of a human-being enjoying music was really traumatic for the family and we’ve had very limited sleep since seeing that. Anyway, you asked about the game, sorry. The oppo were good in possession and packed out the midfield so we had to tinker slightly with the formation without losing our aggression in attack. We got our goal which gave us confidence and I just felt whatever they had we could match at the very least. We created lots of really good chances which is pleasing. It was a hard fought three points and I'm delighted with big performances from every one of the lads”. A much-needed downpour made the conditions underfoot more conducive to good football and it was May and Baker who were moving the ball better in the early stages without creating any clear-cut chances. Gradually Hackney began to impose with some quick attacks on the left and right flanks but the final ball was elusive. On twenty minutes the deadlock was broken. Matty Harris picked up the ball just inside the May & Baker half and with a quick glance let rip with a powerful lob which defied the Keeper’s attempt to scramble back to his line, 0-1. The second half started with Hackney turning the screw and several waves of attack. The equaliser came against the run of play. A quick counter-attack by May & Baker saw a square ball land at the back post and a tap into the empty net was all that was required. The response from Hackney was quick and decisive. Good work down the left from Badu who found Alan McQuade inside the box and the deftest of flicks carried the ball past two defenders and onto the boot of Page who finished in off the post to restore the lead. 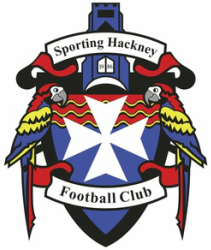 At this point, Hackney were in the driving seat but for the second time in the half May & Baker equalised on the counter. A through-ball with more than a whiffed of off-side was finished by the striker. Tiredness was creeping into the game with fifteen to go and the scores tied. It was the relentless work-rate by the Hackney front four throughout the game that began to pay dividends as this appeared to have ground down the May & Baker defence which was starting to become ragged and leave gaps. With the heavens continuing to open up so was the May & Baker defence and a perfectly weighted Craig Dillnutt through-ball split the May & Baker defensive line for Badu to cut in from the left wing and with only the keeper to beat he kept his cool and slotted home inside the back post for 2-3. With ten minutes left the Parrots were cutting through May & Baker at will and came close to extending their lead several times and were denied by the woodwork twice. Persistence paid off however when the ‘Assist Assassin’ Badu used pace and strength to shake off the attentions of two defenders before cutting it back to Page who had time to take a touch before hitting the net to make it 2-4. With a few minutes to go and May & Baker crossing in from the left the referee blew the whistle and pointed to the penalty spot. The ball appeared to clip the hand of Page on its way over for the softest of penalty awards. The resultant penalty was scored and the game finished 3-4.